Home » News » What are your plans for tonight? The campaign aims to raise awareness of how people can prevent incidents potentially linked with the night time economy, such as assaults, thefts and robberies. 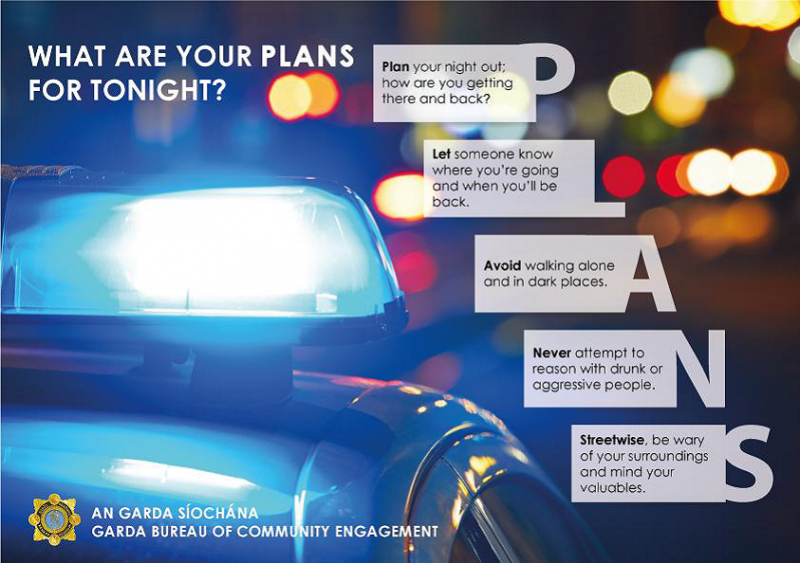 Gardai are emphasising the importance of planning one’s night out. Using the acronym ‘PLANS’, the aim of this campaign is to educate the public on how to enhance their personal security. Planning your journey to and from your night time destination in advance will lessen your exposure to incidents of assaults, thefts and robberies. • Assaults, thefts and robberies are more likely to occur on weekend nights between 8pm and 5am. • 60% of robberies involve the theft of a mobile phone. S Streetwise, be wary of your surroundings and mind your valuables. "We want people to enjoy themselves when out, and taking a few easy steps can greatly reduce the chances of their day or night being ruined. Working together, we can reduce the opportunities available to criminals,” said Sergeant Alan Roughneen of the National Crime Prevention Unit.